The Britax B-Agile is a wonderful little pushchair. It is small enough to put into most car boots or to slide neatly into a gap, but yet is sturdy enough for every day use. It is a 4 wheeled, light weight pushchair with a two step, one handed fold. It boasts a good basket, large lie flat seat, storage in rear of the huge hood and the options to add on a Britax carrycot or car seat, to make a travel system suitable from birth. I have to admit that the B-Agile and I did not get off to the best start. But I will leave that for now, and begin with the positives! The Britax B-Agile is a very neat pushchair. It comes in a small little box, and once opened and the wheels and hood are on, then you are ready to go. The B-Agile lives up to its name and is highly manoeuvrable even one handed. It has a lovely thick foam covered handlebar that feels really comfortable in the hand. The Britax B-Agile has a huge seat – I have to say, our tall (over 100cms) 3 year old, looked dwarfed in the large seat. The seat itself is very padded and comfortable. It seemed to support our 3 year old very well. The footrest was wide enough even for her big feet to perch and at no point did I feel she would try and dangle her legs as she is prone to. She really did look incredibly comfortable and for that reason I would definitely recommend the B-Agile for an older toddler. She did not have a lot of head room under the canopy, but she is tall, and the hood could always be removed. The harness was plenty big enough to accommodate her. There are three harness height settings. However there is a huge jump between the smallest height setting for a newborn, and the two taller height settings. I am not entirely sure why these settings are spaced as such because the middle setting was great for our 15 month old, but there’s a long way to grow from newborn to 15 months! The harness is easily adjustable and can be ‘broken’ to make it a 3 point harness should you wish, but also to make fitting a cosy toes easier. However it was a different story with our 15 month old. He just slumped in the seat. The photos show this well although admittedly in these photos the harness wasn’t properly adjusted. However I spent a long time after this photos was taken getting the straps to the correct height and trying to get him sat more upright and I simply could not manage it. I think an extra crotch setting, or the crotch strap being nearer the rear of the seat, would probably alleviate this issue and would have pulled him more upright. The seat is very deep. To be honest, the seating position for our 15 month old was one of two factors that eventually led us to sell this pushchair. The pushchair was for the 15 month old, not for the toddler and he just was not comfortable. I know we are not the only ones to report this issue. I have seen it said many times. The other factor was the handle height. I do like a relatively tall handle – I am 5ft 6 ins tall. But the B-Agile at the top of the handle was only 101.5cms and underneath the handle was 98cms (our rough measurements). I had some real dilemmas with myself during the period we had the B-Agile, because some features are very good, but however much I pushed the B-Agile – even if it was just for a few minutes nipping into a shop, I could feel the low handle, and it simply was not right for me. Interestingly though a friend of mind has a B-Agile and she is 2 inches taller than me and finds it great! Maybe I just have short arms?!! What then were the good features? I loved the easy to access basket. It was hard to get larger bags past the bar at the rear of the basket, but the side access was great for stuffing things into the corners. I loved the huge storage pocket on the rear of the seat for my keys, purse etc. However I did also find this a little “flappy” especially when folded. It did get dusty. I love the decisive brake. I knew for sure that it was applied. I liked the quality of the padded seat. The handle felt good. I especially liked the fold and the way the wheels neatly tucked in on their own – no rearranging to get them lined up correctly. Above all, it felt good to push and was so easy to manoeuvre. The B-Agile seat is suitable from birth. It does recline to flat using a toggle recline. However if you are not very careful then the recline is very violent!!! The first time we tried it shocked us all as the seat dropped straight from vertical to flat. On other pushchairs, you usually have to nudge the seat slowly down to horizontal!!! We liked the neat little strap holder on the back of the seat for the ends of the straps. When flat, the rear is covered by the large flap of fabric that has the storage pocket in, but you do need to fight your way past this flap to access the basket. This can be zipped off in summer to reveal a mesh fabric for ventilation. It is lovely to be able to see a child through this at the rear of the seat. The seat was easy to push back up after the recline but needed two hands. However after being reclined the mesh fabric ends up behind the child’s head, but it does lie neatly. The seat does sit very upright which is good for older toddlers. We did have an issue with the recline straps becoming twisted (see photo) which meant that we were unable to recline / draw up the seat unit. Bearing in mind this was a brand new pushchair when it arrived with us, this was not good to see. It was easy enough to untangle them, but thankfully we were not out and about when it happened. I do wonder long term whether this would have repeated itself and become annoying. The B-Agile has a very large hood with two fabric panels. In the centre of these panels is a zip and hidden behind this is a mesh panel. I have to say I am not a fan of these mesh panels. We live in the UK where most of the year, even in summer, it can get windy, and our winters can be bitterly cold and wet. I had a similar hood with mesh in on the B-Dual, and I found that it allowed the sun to shine through into the children’s eyes. On the B-Dual the mesh panel afforded a great view of the lower child, but the B-Agile mesh panel simply allows you to see the child’s feet! There is a velcroed mesh (!) Peek a boo window at the rear of the hood but there was no way of keeping it open / rolled up. But I would rather have a large solid 3 fold hood every time than mesh panels in hoods. The Britax B-Agile can take a Britax car seat or Britax carrycot. Apparently I should have had some adaptors in the box, but there were none. Annoyingly Britax do not stock these as a spare part either which seems a little odd! These adaptors should slide onto the chassis behind the elasticated sides of the seat and then the carrycot or car seat fits on top. 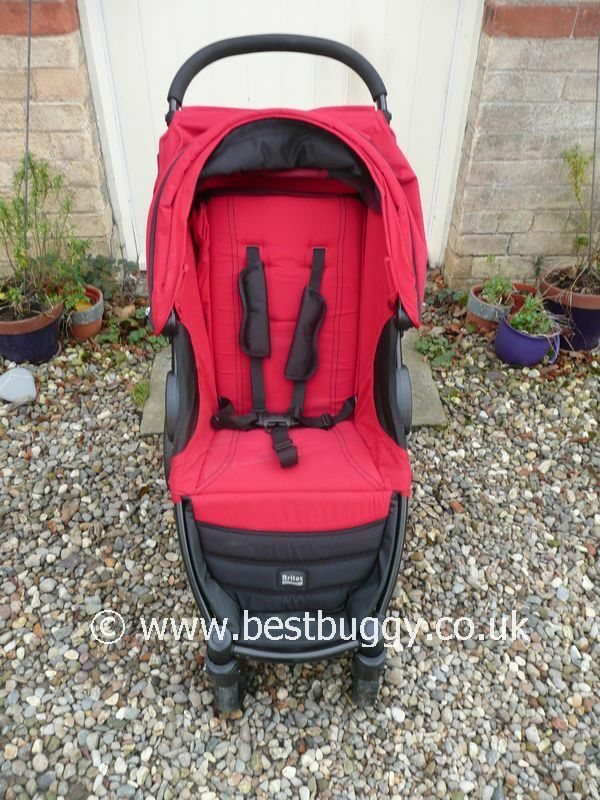 However a friend of mine has a B-Agile with a carrycot on (her photos are below this review) and she says the carrycot is extremely tight to fit. She says she has even checked several times that she bought the correct carrycot (which apparently she has) and she went so far as to say she thinks the Baby Jogger City Mini (her other choice) would have been far easier to use in carrycot mode. She said that she actually did not want to leave the hood on her B-Agile for fear of damaging it with the carrycot in situ. My friend removed the fabric on her B-Agile to put the carrycot on. This makes it look more pram like. It required the use of a screwdriver to remove the fabric, so it is not a quick swap from pram to seat. The downside is that the basket is attached to the seat fabric and so you lose this facility (although there is a way it could be reattached if you do not mind a bit of DIY). But it does mean that the fabric could be removed to be washed. The B-Agile has from 6 inch wheels and rear 10 inch wheels. The front wheels can be swivel or locked. All the wheels can be very easily removed and popped back on again. As I have said before, I think it is very clever how the front wheels neatly swing into place for the fold. The fold on the Britax B-Agile is a two step one handed fold. First remove the child, then push in the grey safety catch on the side of the pushchair. It needs moving down and inwards and it will lock into position. Then simply grasp the black handle in the centre of the seat and pull and the B-Agile literally “snaps” into a folded position. So back to the bad start. When I first took the B-Agile out of the box I tried to open the pushchair. However there is an autolock on the pushchair which needs removing to unfold it. But the fold pull handle of the seat is not central but down one side. So it feels natural to hold the pushchair with the handle nearest you. But then as you try to unfold the pushchair, the pushchair and handle is opening towards you, and your body gets in the way. I have to admit I puzzled over how to open the B-Agile logically and after roping in everyone I met to have a go at opening the pushchair, and even a left handed person, and everyone said that the unfold catch is illogical. Having said that, when it did go in the car, I could undo the catch and the pushchair unfolded perfectly by the time it hit the floor! Most strange, but I was not holding it at that point – the pushchair was flat in the car, so I guess I pulled the handle on those occasions which led to it opening correctly. On top of that, I see the B-Agile as a one handed fold pushchair, therefore it should also be a one handed opening pushchair. I would typically have a baby under one arm and then want to open the pushchair eg getting off a bus. But you need one hand to hold the pushchair by the pull handle and another to undo the autolock!! Not only that, but you think you have just knocked the autolock off with one hand, when it catches on the secondary lock position (see the ridges in the photo of the catch)! This was SOOOOOOO annoying because with one hand holding the pushchair, and literally fingers to flick the autocatch off, it meant trying again to get it off ie a two step process. I never worked out how to push the catch off without it catching on the secondary lock. We bought this pushchair to decide whether to keep the Baby Jogger City Mini 4 or the B-Agile (see the Side by Side comparisons section for the review and photos) but if I had known we were keeping the B-Agile, the screwdriver would have come out and the lock would have been removed!!!! The Britax B-Agile comes in two colours – Black and Chilli Red. I was told that the black was like the typical B-Agile fabric, but the red was a suede feeling fabric ie soft. So I was happy that I had ordered a red one. 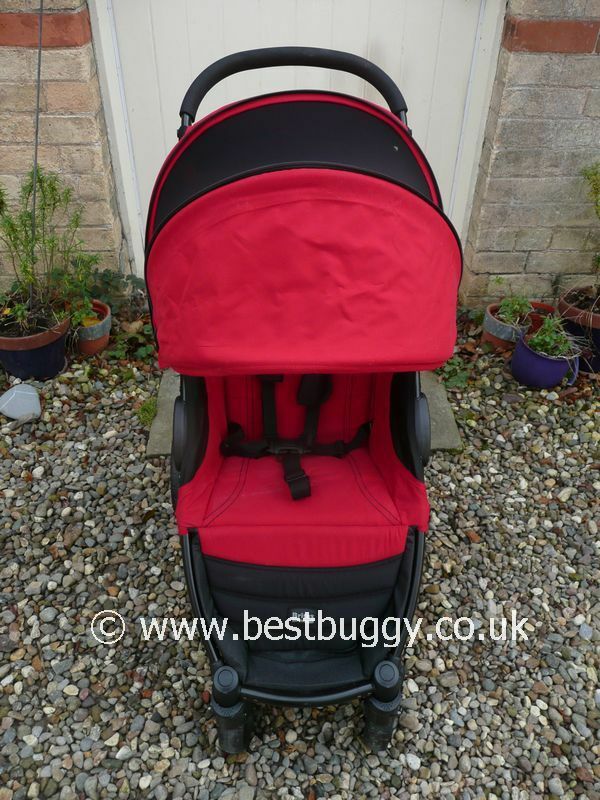 However I soon regretted the decision because by the time I had laid the pushchair down to get everything out of the box, opened it up, fitted the wheels and hood, the red fabric was already covered in dust. If you look at the photos near the bottom of the photoset, bearing in mind this pushchair was brand new, straight out of the box – yes admittedly briefly laid on the floor or paving slab – but just look at the dust and marks on the fabric and handle. If you note, the footrest is actually clean, so it is not children with dirty feet or hands to blame!! I have never had a pushchair with such awful fabric. It slowly attracted every speck of dust, dirt, fluff etc and it was a nightmare to clean – and I only had this pushchair for a short while! I believe Britax have changed their fabrics for 2012, and I really hope that either the red has improved, or the black has not become the same type of fabric. The B-Agile does not freestand, but it did store on its side. We worried about how easily the foam on the handlebar would stand up to being carried around, put in and out of the car etc. without getting damaged. The Britax B-Agile comes with a raincover and (supposedly!) the adaptors to take the carrycot or car seat. 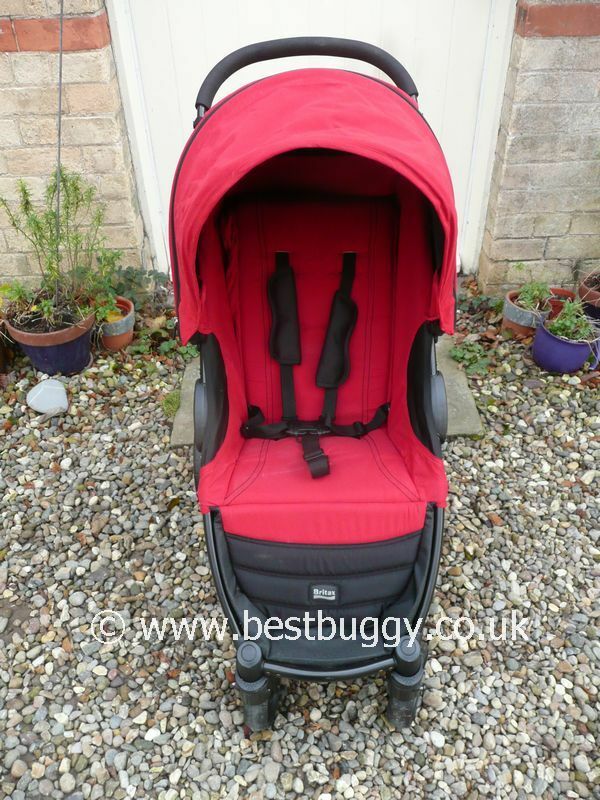 A bumper bar is available as an optional extra, along with the carrycot and car seat. All round the Britax B-Agile is a good all round light weight travel system pushchair. It is a shame that in some places there is really good attention to detail, but in other places, more attention to detail would have made a real difference to the user experience; after all, most of the points above are relatively minor and could be fixed. Even with all the niggles that I found, I would still prefer to buy a B-Agile to an umbrella fold pushchair because the pushability is so good and the chassis is so sturdy. However do consider the height of the people using this pushchair when considering buying.